Ta’anit Tzedek hosted a powerful and inspirational conference call today with Irish Nobel Laureate Mairead Maguire and Israeli human rights activist Yonatan Shapira. Both spoke movingly about their activism and their participation on the latest Freedom Flotilla to Gaza. Click here to listen. Please send it on. Addendum 10/21: The Velveteen Rabbi has just posted a long piece about the call , complete with extensive background and transcriptions. Thanks, Rachel! This entry was posted in Gaza, Human Rights, Israel, Jewish Fast for Gaza, Nonviolence, Palestine on October 21, 2010 by Rabbi Brant Rosen. Yesterday Ta’anit Tzedek hosted an incredibly powerful conference call with journalist/blogger Ashley Bates, who spoke to us from Gaza City. If you didn’t make the call, you can listen to it yourself by clicking here. Ashley’s personal testimony provided an extremely important antidote to the misinformation about Gaza that we’ve heard bandied about – particularly since the flotilla crisis. At the opening of our conversation, I asked Ashley to address the claims of the Israeli government that “there is no humanitarian crisis in Gaza” and that no one is starving as result of Israel’s blockade. I also asked her to address press reports that cite the upscale Roots Restaurant and well-stocked market stalls in Gaza City as proof that things are not nearly as dire as critics are claiming. Ashley validated the reports that these kinds of goods are indeed available in the more affluent areas of Gaza. She added, however, that the only ones who can afford them are internationals such as herself or a relatively small number of affluent Gazans. She pointed out that the Gazan economy has completely collapsed as a result of the blockade, causing widespread unemployment and poverty for an overwhelming number of citizens. 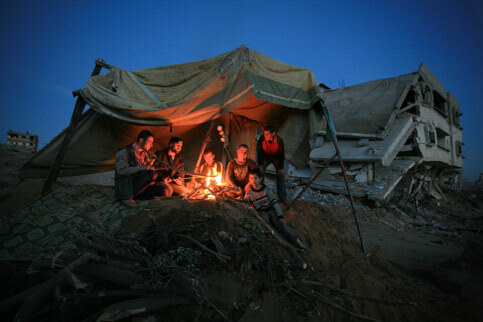 Ashley herself can afford to live a relatively comfortable life in a rented Gaza City apartment. Unlike most Gazans, she could purchase her own electric generator – so she is unaffected by the daily eight hour blackouts that are a familiar part of life in Gaza. Ashley said that she saw no signs of starvation, but it was clear to her that the nutritional needs of Gazans are not being met. Eight out of ten Gazans are on some form of international aid. In the refugee camps, Gazans are essentially living on diets devoid of fruits and vegetables. As a result, anemia and malnutrition is on a sharp rise – particularly among children. She also witnessed considerable numbers of homeless Gazan families, whose homes were destroyed during Israel’s military assault in December 2008. The majority of them have moved in with relatives or friends and live in very cramped quarters. Others rent apartments they cannot afford, relying upon the largess of landlords. Still others are forced to live in unstable, partially destroyed residences or in tents next to the rubble of their former homes (see pic above). Ashley said she was not qualified to to comment as to whether this all constitutes a “humanitarian crisis.” She did, however, call it “a crisis of human dignity” – and it is clear to her that these circumstances are a direct result of the blockade. As to research on saying that there isn’t a “humanitarian crisis” in Gaza and that no one is starving, we will have that on what Luntz and Greenberg are testing next week. But you don’t need that data to know it is a complete dead-end of a message. Reporters and leaders all over Washington are complaining about this and some say they see Israel and cold and heard hearted. Given that 6 more flotillas are headed to Israel (including one of Jews from Germany and one of Jews from the UK) we need to make sure we understand this well. Watch this from Jon Stewart. Watch to the end and listen to how they react to when Krauthammer uses the message…ouch! On a good note, the topic in the US tonight will shift to energy. Alternative energy is obviously a great topic for Israel as Israel has much to say that could help on this. Spin notwithstanding, it’s an amazing admission. (You know, it’s often occurred to me that if Israel spent just a fraction of the time and energy it spends on public relations to actually own up to its responsibility for this crisis, we might see some real progress toward a resolution). In the meantime, thank God for sane witnesses such as Ashley Bates. Please listen to the call. This entry was posted in Gaza, Human Rights, Israel, Jewish Fast for Gaza, Palestine on June 18, 2010 by Rabbi Brant Rosen. Ta’anit Tzedek’s next monthly fast day is Thursday, April 15. To mark the occasion we’ll be sponsoring the second monthly phone conference of our new initiative, Resisting the Siege: Conversations with Gazans. This month our call will spotlight the Popular Achievement Program in Gaza – a project of the American Friends Service Committee. This remarkable program works with 14-17 year old Gazan children, instilling values of civic engagement and empowerment to achieve positive social transformation and sustainable development in their communities. As you can see from the clip above, these kinds of programs demonstrate the critical importance of strengthening Palestinian civil society. Initiatives such as the Popular Achievement Program – not blockades and bombs – are the true key to security for Gazans as well as Israelis. On our call we will be joined by Popular Achievement director Amal Sabawi and two teenage program participants, Sarah and Roba Salipi, who will discuss how they live with the daily challenges of life in Gaza. The gathering will take place at the Evanston Galleria, 1702 Sherman Avenue, Evanston, at 7:30 pm. Check the Ta’anit Tzedek website for more info. This entry was posted in Gaza, Human Rights, Israel, Jewish Fast for Gaza, Palestine, Politics, War on April 8, 2010 by Rabbi Brant Rosen. Ta’anit Tzedek – Jewish Fast for Gaza has begun a new initiative: “Resisting the Siege: Conversations With Gazans.” On each monthly fast day (the third Thursday of every month) we will convene a conference call featuring a Gazan Palestinian who will discuss his/her experience of life in Gaza, the effects of the siege, and how we can best support efforts to lift the blockade. 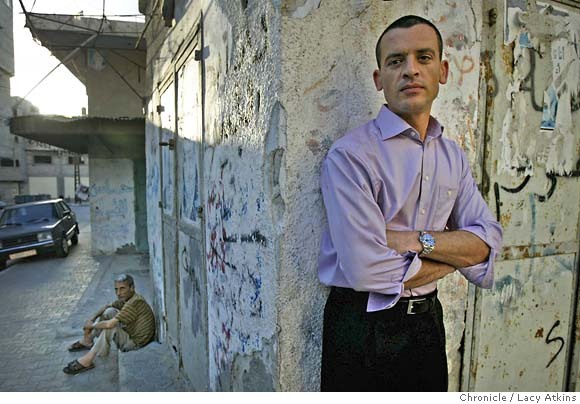 Our next conference call will take place this Thursday, March 18, at 1:00 pm EST and will feature Sami Abdel Shafi (above) an independent political analyst and writer who lives in Gaza. 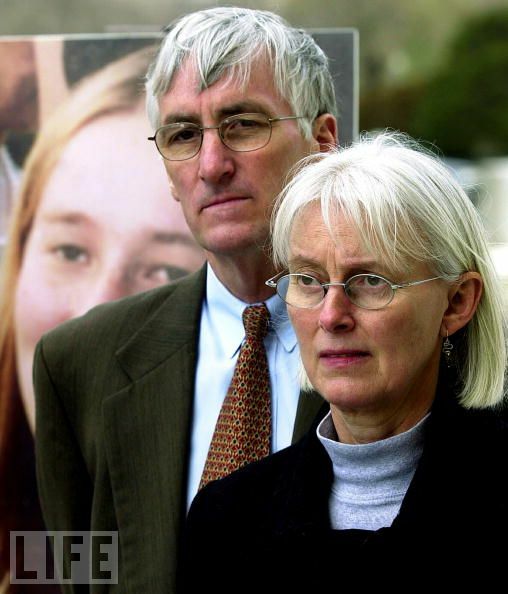 In addition, we will hear from Cindy and Craig Corrie whose daughter Rachel was killed by an Israeli bulldozer in 2003 as she tried to protect a Gazan Palestinian home from demolition. Almost nothing has been more deceitful than casting Gaza as a humanitarian case. This is becoming exponentially more problematic a year after the war. Gaza urgently needs far more than merely those items judged by the Israeli military as adequate to satisfy Gaza’s humanitarian needs. This list of allowable items is tiny compared to people’s needs for a minimally respectable civil life. Gaza is not treated humanely; the immediate concerns about the situation have clearly given way to long-term complacency, while failed politics has now become stagnant. The humanitarian classification conceals the urgent need to address this. Moreover, many in the international community have conveniently resorted to blaming Palestinians for their political divisions, as though they were unrelated to Israel’s policies – most notably Gaza’s closure after Israeli disengagement in 2005. I also encourage you to read this piece, in which Abdel Shafi discusses the challenges facing the Palestianian Authority during this latest incarnation of the peace process. The Corries (left) will be joining our call from Haifa where they are currently participating in the hearing of a civil suit they have brought against the Government of Israel. Following Rachel’s death, the Israeli government promised the Bush administration a thorough, credible and transparent investigation of Rachel’s killing. Now seven years later, no such investigation has taken place. This is a culmination, really, of seven years of our family searching for some sort of justice in the killing of Rachel. And we’ve tried to do that through diplomatic means, and we’ve asked for a US-led investigation into Rachel’s killing. We also understand that the Israelis, through Prime Minister Sharon, promised President Bush a thorough, credible and transparent investigation of Rachel’s killing. But, by our own government’s measure, that has not happened. So we’re left with simply a civil lawsuit. So, we’re accusing the state of Israel of either intentionally killing Rachel or guilty of gross negligence in her killing seven years ago. And so, we’re seeking—the only thing you can seek in a civil case is damages. You know, so it’s really a very small part of the story that’s gone on in our lives. But it’s critical to have our time in court. Our motivation for that was largely that it is an avenue which we understood we would be able to pursue and get information. So, through the discovery process, we were hoping to get a good deal of information. We have gotten some, but they’ve used sort of secrets of state to keep us, block us, from getting other evidence into court. But we’re going forward, and we’re very hopeful that we will get a fair trial. (One) other very specific thing that people could do, and I’m calling for people to do—the US government has come out against the blockade or the continued occupation and siege on Gaza. The children that were behind the wall that Rachel stood in front of are still under a state of siege. And I think that, very specifically, people around the world and certainly in this country could write, call or fax the White House and say, not only should we be working to have the Israelis lift that siege, but if they continue to be unwilling to do so, then the United States should come in there, work out a way that they could come in and—the Berlin airlift, it sent a message to the world about our ability to protect people around the world and our willingness to do so. If we did something similar by sea to the Gaza Strip, it would change the view of Americans around the world for maybe another fifty years. It is something that’s doable, and it’s something that the people out, your fans, could actually physically do and ask the White House to do that. Questions for Conference Call: If you would like to suggest a question for Mr. Abdel Shafi or for Cindy or Craig Corrie, please email your question to rabbrianwalt@gmail.com or ravboaz@comcast.net no later than Wednesday night. This entry was posted in Gaza, Global Activism, Israel, Jewish Fast for Gaza, Palestine, Politics on March 16, 2010 by Rabbi Brant Rosen. When Brian Walt and I initiated the Jewish Fast for Gaza last year, advocating for a lifting of the Gaza blockade was not a particularly popular thing to do. I’m gratified to see that situation is beginning to change. The unabated suffering of Gazan civilians highlights the urgency of reaching a resolution to the Israeli-Palestinian conflict, and we ask you to press for immediate relief for the citizens of Gaza as an urgent component of your Middle East peace efforts. Several American Jewish organizations have publicly supported the letter and I was happy to learn that J Street actively lobbied members of Congress to sign on. Take a look at all 54 signatories of the letter – if your Rep is not on the list, please consider contacting him/her to express your disappointment. (For my part, I’m very disappointed that my Rep, Jan Schakowsky – an active and vocal supporter of J St. – chose not to sign on). Finally, if you agree with the sentiments expressed above, please sign on as a supporter of Ta’anit Tzedek – Jewish Fast for Gaza. Our next fast day is Thursday, February 18. This entry was posted in Gaza, Great Britain, Human Rights, Israel, Jewish Fast for Gaza, Palestine, Politics on February 9, 2010 by Rabbi Brant Rosen. Most people probably don’t realize this, but rabbis need rabbis too. And there are a lot of great rabbis out there. Over the years I’ve been personally inspired by many of them: remarkable, talented leaders whose work challenges me, drives me and constantly reminds me why I do what I do. So with this post I’m debuting a new series I’m calling “My Favorite Rabbis:” ongoing profiles of the contemporary rabbis whom I consider to be my own spiritual teachers. I’ll start by introducing you to Rabbi Everett Gendler, a Conservative rabbi whose moral courage has provided Jewish leadership for some of the most important progressive causes of our day. Today, some fifty years since he became a rabbi, I believe he remains on the cutting edge of the issues that truly matter. This MLK weekend, it is certainly appropriate to note that Rabbi Gendler was one of the first rabbis to become actively involved in the struggle for civil rights in America and played a critical role in involving American rabbinical leadership in the movement. It’s doubtful that American rabbis would have stepped up to this struggle nearly as much had it not been for Rabbi Gendler’s prophetic influence. During the early and mid-1960s, Rabbi Gendler led groups of American rabbis to participate in numerous prayer vigils and protests throughout the South. Of course many know that the legendary Rabbi Abraham Joshua Heschel marched with Dr. Martin Luther King in Selma in 1965. I imagine far fewer are aware that it was in fact Rabbi Gendler who persuaded Heschel to do so. 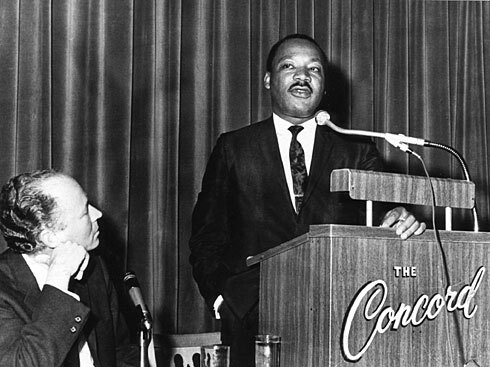 Rabbi Gendler was also instrumental in arranging Martin Luther King’s keynote address at the Rabbinical Assembly’s convention on March 25, 1968. This now-legendary speech took place at the Concord Resort hotel in New York’s Catskill Mountains just 10 days before King’s death. (That’s Rabbi Gendler to the left of Dr. King in the pic above). Today, decades after King’s death, Rabbi Gendler remains an eloquent Jewish advocate for the path of nonviolence. His work has taken him across the world – most notably to India where he and his wife Mary teach the principles of nonviolence to Tibetan exiles. I’m personally honored to serve with Rabbi Gendler on the Elder’s Council of the Shomer Shalom Institute for Jewish Nonviolence. 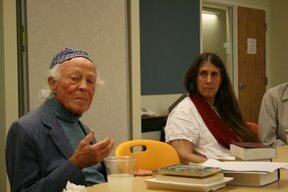 In this picture, he leads a workshop at JRC in 2008. Shomer Shalom founder Rabbi Lynn Gottlieb (someone whom I may well be profiling in the future) is sitting next to him. Rabbi Gendler has also been a long time advocate for Palestinian human rights – and his courageous stands have made it possible for new generations of rabbis to find their own voices on this painful issue. When Rabbi Brian Walt and I first began Ta’anit Tzedek and were looking for rabbis to join our campaign to protest the blockade of Gaza, we immediately turned to Rabbi Gendler, who joined our effort without hesitation. It is difficult to describe how much it means to know there are rabbis out there like Everett, someone who has been putting himself on the line for so long, and upon whom we always know we can rely for guidance and support. Rabbi Gendler was also one of the first Jewish leaders to embrace environmentalism and vegetarianism long before they became fashionable. As the rabbi of a green synagogue myself, I recognize a tremendous debt to Everett, who more than anyone helped to put environmental issues on the radar screen of the Jewish community. Gendler’s conversion of that eternal light marks the first known action to green a synagogue, making it more spiritually and ecologically sustainable, and Gendler himself, now Temple Emanuel’s rabbi emeritus, has been hailed as the father of Jewish environmentalism. There so much more to say about Everett and his work. I suppose the most essential thing I can say about him is that he was and remains a spiritual maverick. His work remains as relevant and courageous as ever. As we honor Dr. King this weekend, it’s critically important to honor those who continue his to walk his path in our own day. For me and so many others, Rabbi Everett Gendler is the one who teaches us how to walk that walk. This entry was posted in American Jewish Community, Civil Rights, Environmentalism, Gaza, Human Rights, Israel, Jewish Fast for Gaza, Judaism, My Favorite Rabbis, Nonviolence, Palestine, Peace, Religion on January 17, 2010 by Rabbi Brant Rosen. I’m thrilled to report that the Israeli human rights organization B’tselem has officially endorsed Ta’anit Tzedek. B’tselem has long been high up on my list of organizations that do right by the Jewish people and we’re incredibly honored to receive their support. The moral courage of the Israeli human rights community is something of which all Jews can justifably be proud. But I also see little point in this pride unless we are ready to confront the painful truths they bring to our door. B’stelem is among the true modern day prophets of Israel. It is time we heeded their call. This entry was posted in Gaza, Human Rights, Israel, Jewish Fast for Gaza, Palestine, UN, War on October 26, 2009 by Rabbi Brant Rosen.